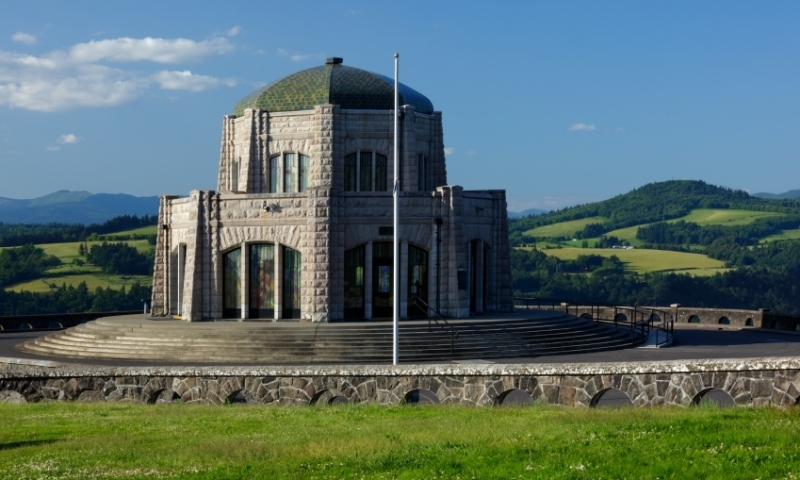 Recently restored and reopened, picturesque Vista House near Corbett, Oregon continues to delight visitors—the structure’s castle-like appearance has made it the most photographed landmark in the Columbia River Gorge. Located 24 miles east of Portland atop Crown Point; take I-84 to Exit 22. Museum, gift shop, and espresso bar are open daily 9:00-6:00 year-round. The structure is Oregon’s most-photographed landmark; check out the Portland Women’s Forum Viewpoint 1.5 miles from Vista House for a great view. Sitting atop Crown Point on the Historic Columbia River Highway overlooking the Columbia Gorge 733 feet below, majestic Vista House was built in 1918 according to the vision of Samuel Lancaster, the engineer who supervised the Columbia River Highway project. Lancaster proposed Vista House as “an observatory from which the view both up and down the Columbia could be viewed in silent communion with the infinite.” His dream came true, and the octagonal stone structure has enthralled travelers for nearly 100 years. Today Vista House is a museum listed in the National Register of Historic Places. Museum exhibits chronicle the history of the house, the highway, the Gorge, and the region’s pioneer settlers. Volunteers are on-site to answer questions, conduct special tours, and provide group presentations. A Museum Gift Shop showcases crafts and artwork by local artisans and an Espresso Bar serves light refreshments year-round. Located about 24 miles east of Portland and near Corbett, Oregon. From Interstate 84, take Exit 22 toward Corbett. Turn right on NE Corbett Hill Road, continue right to stay on NE Corbett Hill Road, then take the second left onto E Crown Point Highway/E Historic Columbia River Highway. Both Vista House Museum and the adjacent Museum Shop and Espresso Bar are open daily year-round from 9:00 am – 6:00 pm. Admission is free; donations are gratefully accepted. The Portland Women’s Forum Viewpoint, 1.5 miles from Vista House, provides a spectacular view of both Vista House and the Gorge. Travel to the tip of the spectacular Olympic Peninsula.